Welcome to my Autumn Review- I hope it finds you well. It has been an extremely busy few months tackling issues across the South. I now have over 400 open files on my desk ranging from housing applications to start up businesses looking for help and everything in between. In addition, I have been pursuing the following local issues; Trouble with Town Hall Transparency, Christmas Market for the Town Hall, The Battle of the Green Road, The Great Connell Saga, Derelict Disappointments in Kildare Town, Suitable Skate Park Locations, Accountability in the Arts section of the Council, Promoting Business in Eyre St. and George’s St. and SKET’s Battle for another Second Level school, to name just a few! On a national level, as recently as last Wednesday, on my behalf, Senator Catherine Noone asked the Minister for Education and Skills for an update with regard to the Dept’s Review of Post-Primary Places required from 2017. I was also added to a list of General Election candidates by the Irish Independent last weekend dubbed #One2Watch in the General Election! 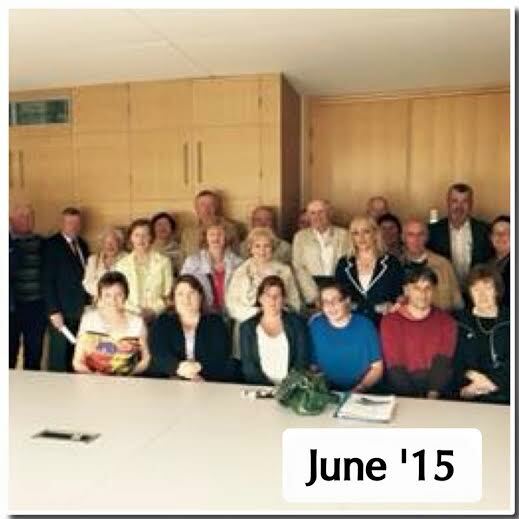 So as you can see it has been ‘all systems go’ for Team FMH over the last few months. Athy 9.30-10.30, Kilcullen 11- 12midday, Kildare 2.30 – 3.30 every Thursday. 3) the next contract – which may or may not include seating/kitchen/exterior works and for which €225,000 has been allocated according to the Director of Service.Funding sources need to be clarified. And the former Town Council’s role clarified and publicly acknowledged. 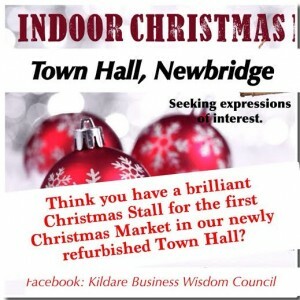 The Kildare Business Wisdom Council, who were responsible for the hugely successful Busk and Food Festival earlier this year, is in the process of planning a Christmas Market in the Town Hall for this Christmas. As a founder member of the group I am particularly eager that the development and the setting up of the management structure of the Town Hall continue to be kept on track. The current phase of the Town Hall development will be finished in the last week of November. 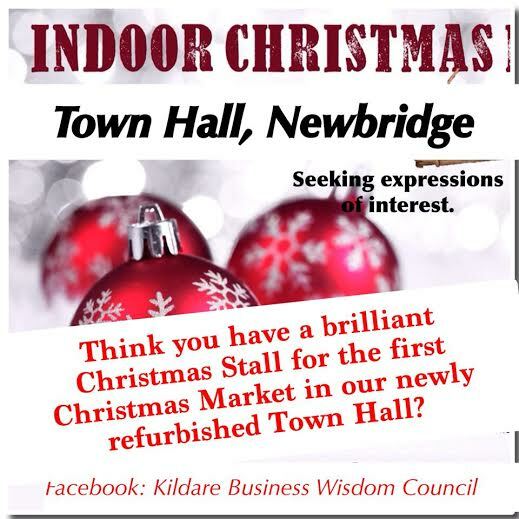 Some months ago, I informed the CEO of KCC and more recently the relevant Director of Service, of Kildare Business Wisdom Council’s intention to hold a Christmas Market in the Town Hall. 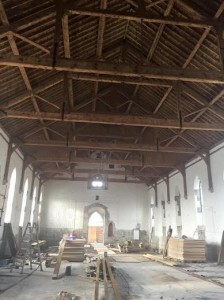 Although the Town Hall will not be fitted out completely, it will be finished to a point at which its doors can be opened to the public for a Christmas Market. Following a petition, which we (parents and residents) signed and submitted last November to support my first motion regarding the dire conditions on the Green Rd., little progress was made despite a follow-up site inspection by the area engineer in December. After a second motion which I submitted in June 2015, I received the following report from the council which gave a litany of reasons for the experienced delays. 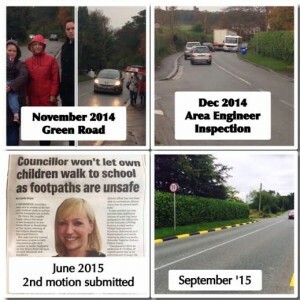 (Link below) Further discussions between my office and the Council have taken place since then and I am delighted to see at least that our concerns about safety on the Green Road are starting to be taken seriously. In September traffic calming measures were put in place for the opening of this academic year on the Green Rd. Road safety is paramount for our families and students. Thanks to the residents and parents for their action (and patience!) 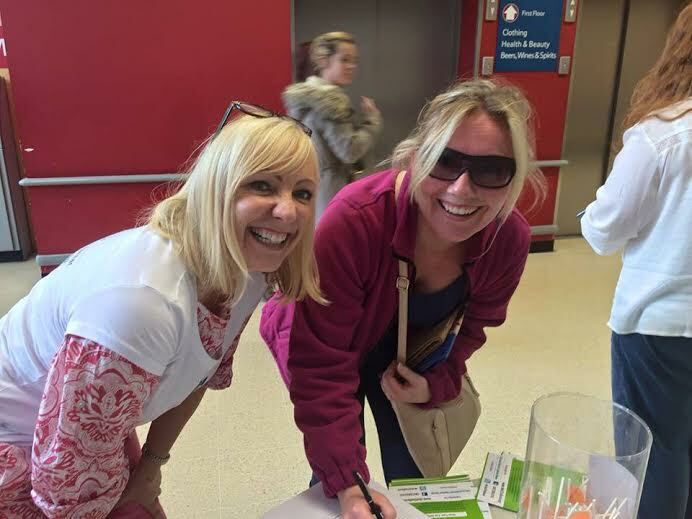 with the petition-the hard work has finally paid off. I will be keeping an eye on the impact of the traffic calming measures on traffic and I welcome your feedback here too. Farcical use of ‘In committee’ meetings to gag people-the Great Connell saga. Kildare-Newbridge Municipal District has had ‘in committee’ meetings around the Town Hall, the Skate Park and more recently about the chronic issue with HGVs along Great Connell. “ In committee” means that no-one is allowed to discuss the content of the meeting once the meeting is over. The HGV traffic along Great Connell is an issue that I have been highlighting publicly for over 12 months now, working closely with residents. ‘in committee’ should only be used – as per the Local Government Act – if it is in ‘in the public interest.’ Instead it is being used by both officials and Councillors ‘to protect people from being reported on’ or ‘to stop an issue being discussed by one Councillor’ . This was the explanation given by Mayor Kennedy to residents at the start of a recent second meeting between the Council, residents and representatives from Lidl to discuss the chronic issue with HGV’s along Great Connell. It is farcical that I am now prevented from talking about the presentation by the Council in relation to the issue which I and the residents had freely talked about on radio and in the press before – a topic that I had put forward several Council motions on. Perhaps that’s the problem. I will not be silenced on this issue by the inappropriate use of the “in committee” mechanism. 5. Derelict building in centre of Kildare town –our heritage town. 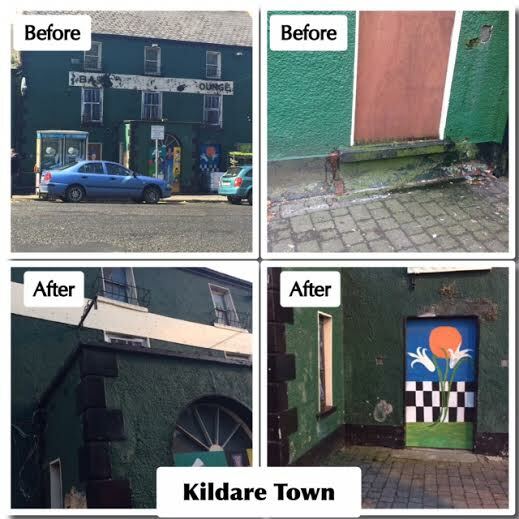 I requested earlier this year an assessment of Grace’s Pub, Kildare Town for dereliction based on the state it was in at the time. After weeks the Council informed me that despite its condition (the urine and excrement on the wall, lines hanging at head height, broken signage, dilapidated paint-work and clear view of unkempt backyard through gates at the side) the building was not derelict. Some improvements have been made including masking the view of the back and painting pictures on the windows. While I welcome the attempt to cover over a building that has been left uncared for in the middle of our Heritage Town, IT DOES NOT GO FAR ENOUGH. 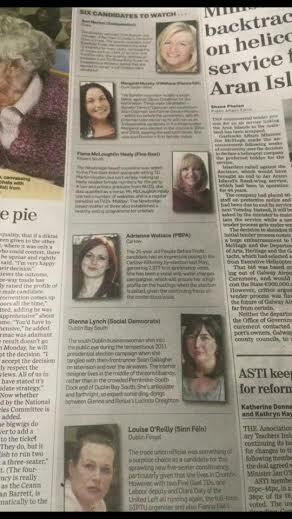 The Irish Independent recently identified me as one of “ Six Candidates to Watch” for the General Election. I am certainly working to deliver for those who are watching and waiting for change in Kildare South. Our campaign for ‪#‎choice and ‪#‎diversity will continue in earnest in South Kildare through the SKET campaign. On Facebook visit – Educate Together Secondary School Campaign for Kildare South or show your support on Twitter @sket2ndlevel.